We all know turmeric as the queen of spice in the kitchen. We use it as a beauty aid to banish blemishes and make our skin glow. Known as a healing herb, it has the properties that can reverse the effects of health problems. Its multiple curative properties make turmeric a truly functional spice everywhere – in food health and beauty. Most of us are well aware of this golden spice and its various healing powers consumed for health and well-being. It is a popular Indian spice used for flavouring multiple Indian dishes from curries to fries, to lentils to broth – delighting palates everywhere. Traditionally Indian brides (even grooms) ritually apply turmeric paste to make their skin glow flawlessly before the wedding ceremony. It has been one of the main components in the Indian Ayurvedic medicines since ancient time. Known also to be used widely in Chinese medicine and traditional medicines of the tribes. Recent studies have also revealed astounding discoveries of its age-old effectiveness. What Makes Turmeric a Sought after Spice? Scientist and researchers have discovered over 300 components in turmeric that are valuable in a variety of its own ways. Components include bioactive compounds and usual nutrients such as proteins, fats, carbohydrates, vitamins, dietary fibre and minerals. Turmeric is also a source of omega-3 and omega fatty acids. Components such as oleoresins, turmerone, ar-turmerone and zingiberene contribute to the aromatic properties of turmeric. But the true healing powers of turmeric lies in its bioactive phytochemical components. These include polysaccharides, curcuminoids and essential oils like curcumol and curdione (source). The most well-known and active curcuminoid is Curcumin, that gives turmeric its bright yellow colour and medicinal properties. 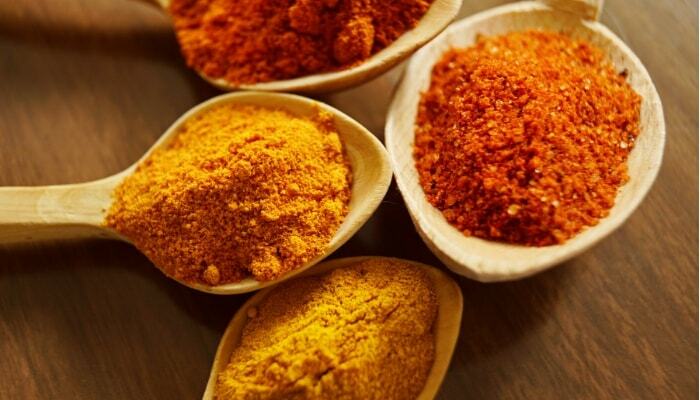 It is also one component that determines the value of turmeric. It plays a major role in the treatment and prevention of various diseases. Our present world is engulfed with pollution and noxious environment. Various illnesses, new and evolving eludes treatment. New drugs are being developed to combat these illnesses but another problem that comes along with this is the problem of side effects with modern medicine. Which is why going back to our roots and allowing ourselves to use natural remedies is the best solution. Turmeric for inflammation: Inflammation is the body’s natural response to diseases which manifest as aches, pains, causing us extreme stress at times. Turmeric has been proven to be effective in inflammation. The curcumin present in turmeric is a potent anti-inflammatory that helps reduce and relieve chronic pain enabling the body to live free from pain. It is safe and provides long-lasting effectiveness. 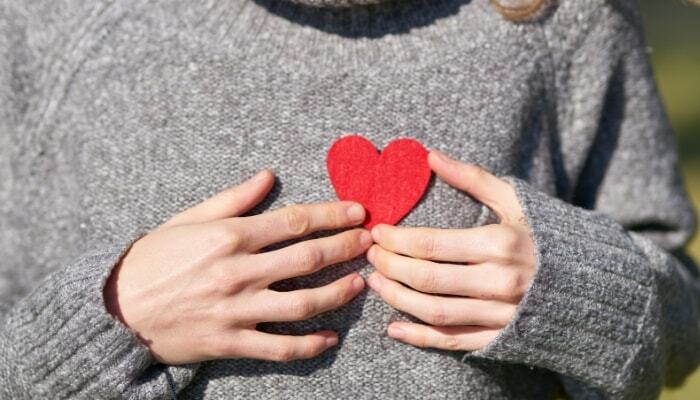 Turmeric for heart: We’ve come to know that heart ailments are common these days. And turmeric has been proven effective against these ailments. It helps improve the functioning of the blood vessels and this helps to prevent various heart diseases. It protects the heart and consuming even small amounts of curcumin from turmeric will significantly improve and stabilize cholesterol level that contributes to the overall heart health. 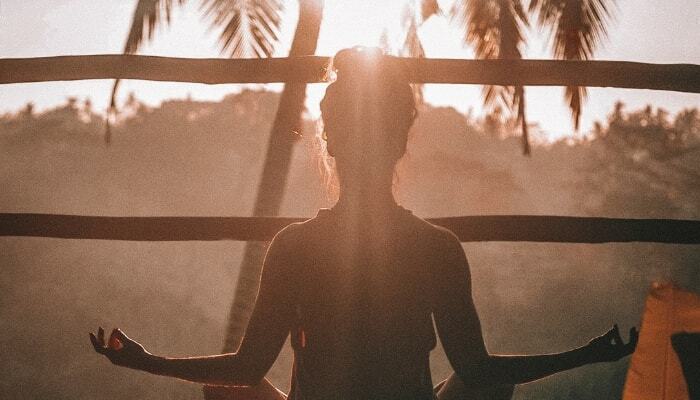 Turmeric for mental health: Among the most troublesome diseases are those of the brain and neurodegenerative disorders. By consuming turmeric, you can improve the oxygen intake of the brain, that further facilitates the brain’s functions and processes. It is extremely beneficial for healing the brain and for increasing the memory function. The curcumin present in turmeric is effective in slowing down progression of these conditions. Not only that it is effective in improving brain functions and preventing many other diseases psychiatric conditions as well. Turmeric for gut health: Anti-inflammatory properties of turmeric helps relax the gut muscles to relax. This allows the food to be digested at ease and does not cause any harm to inner lining of the skin. Turmeric also helps promote the immune response of the gut while also reducing the pain caused by enzymes that produces gastric acids. Turmeric for healthy skin: Turmeric has numerous healing properties for skin. With its anti-inflammatory, anti-bacterial and anti-fungal properties which is great for maintaining healthy skin. It improves the skin texture, removes acne, skin blemishes and other skin diseases like eczema and acts as exfoliator. It also helps reduce redness and other skin irritations. As you can see turmeric is effective numerous problems, mainly because of its potent anti-oxidant and anti-inflammatory properties especially due to curcumin. You can also use turmeric for depression, read why you should use turmeric for curing depression. So making turmeric a part of your daily dietary habit can spare you from nagging health problems, solve beauty issues, save you money and let you enjoy life as you should. 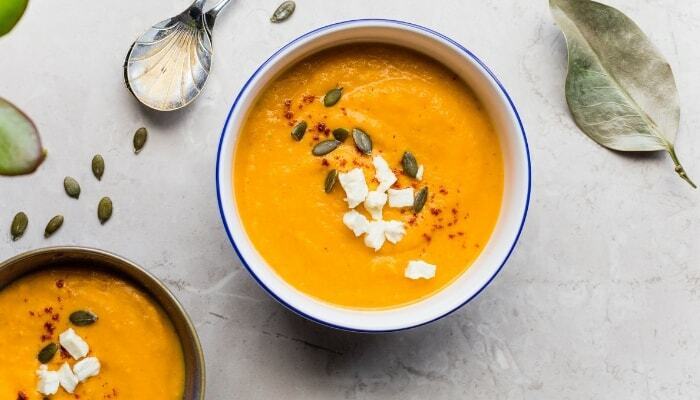 For cough, sore throat and cold: You will need – 1 teaspoon turmeric powder, 1 teaspoon ginger extract (crushed), 10-15 black peppercorns (crushed or powdered), 1 teaspoon mustard oil, 2 teaspoons raw honey. Mix all the ingredients thoroughly using a mortar and pestle. 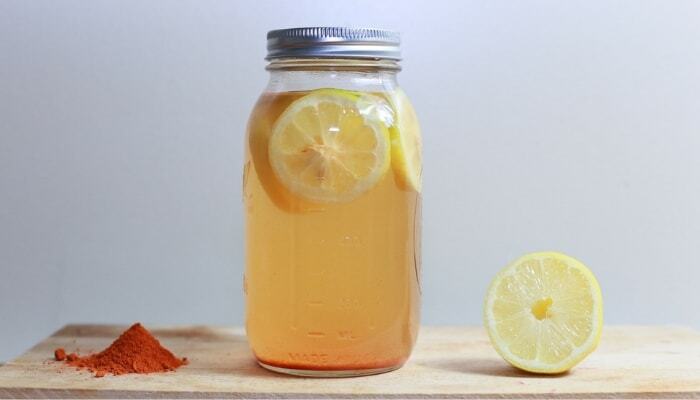 Take an empty mason jar and add 1 cup of boiled water. Add the rest of the ingredients into the jar. Mix and shake it well. Store it or use it 2 or 3 times a day as required. 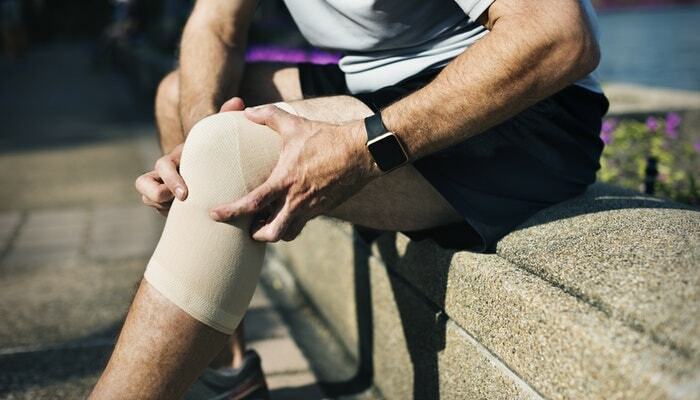 For wounds, cuts, bruises and burns: You will need – 1 teaspoon turmeric powder or raw turmeric root, 1 teaspoon of mustard or coconut oil to give the required viscosity. Mix and apply all over the affected area. Once applied the wound will stop bleeding, reduce the pain and stop the infection. But make sure you bandage the wound. In case of burns apply on the affected area with 1/2 teaspoon of honey. For pimples and acne: You will need – 1/2 teaspoon of turmeric powder, 2 teaspoons of lemon juice and 1 teaspoon of honey. Start by making a paste by mixing all of the ingredients. Wash and dry your face and apply it on the affected areas of the face. Leave it for a few hours and wash thoroughly with warm water followed by cold water. While most turmeric varieties have a curcumin content of 2-3% that may suffice for cooking, but for health that’s not quite enough. Among all the turmeric specimen, the Lakadong variety that grows only in Meghalaya East Jaintia Hills district has the highest curcumin content that ranges from 7.5-9.20%. The soil and climatic conditions of the location give it such a high concentrate of curcumin content. Making it one of the best turmeric variety with a Geographical Indication tag. 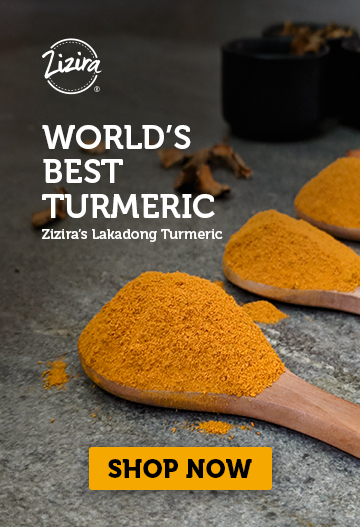 If you’re looking for a way to heal your health naturally using turmeric, then you can go for the world’s best turmeric, Lakadong. Previous Post: « Is Lakadong Turmeric an Heirloom Food?